The game of Bingo is without a doubt one of the funniest games on the web and in the actual gambling rooms. Partly it is due to the fact that the winning patterns are different from one gambling room to another and the pattern itself might look like numbers, letters of the alphabet and even images of fruit. On special dates, the game of Bingo pattern can be shaped like hearts, Easter bunnies. Frankly speaking, the selection of the Bingo pattern depends on the gambling room manager and his imagination. 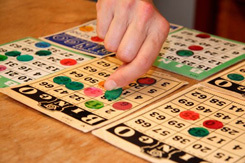 Bingo is considered to be the funniest game among card games, slots and online roulette games due to fanciful patterns. You will surely like the specific gaming rules of Bingo that are quite different from the rules of blackjack, poker, slot or roulette game. Standard patterns - the patterns which are stable and might not be moved on the ticket. Crazy pictures - the patterns which can be turned in 90 degrees for a win. Wild pictures - not fixed pictures which do not change the shape, however, may be placed anywhere on the cardboard card. Additionally to the typical patterns of either horizontal, vertical or diagonal lines there are few more patterns known as Railroad tracks, Four corners etc. Four corners - four single squares covering the corners of the ticket. Kite - a picture in a form of a 2x2 figure in one of the corners of the card and a diagonal stripe from that nook to the opposite one. Frame - outward frame which is a line covering all the squares along border of the ticket. Railroad tracks - two twin stripes on the 2nd and fourth line. Double and Triple stamps - are 2 or 3 2x2 figures in the corners of the Bingo ticket. Clover leaf - a picture of four 2x2 squares that cover all the corners of the Bingo ticket. Moreover, few of the games especially the Internet games have the winning pictures that change after every win and the last picture is the coverall. Example, when the premiere winning picture is a stripe, the following might be 2 stripes, and the 3rd (the jackpot winning one) is 3 lines.